A self described foodie cooks, eats and blogs. I am way behind on my posting about the different meals I’ve made recently. It seems anymore that I either don’t have time to cook at all or when I do, I don’t have time to post about them. Case in point, this is the dinner from St. Patrick’s Day, which was over a week ago. Anywho, we ended up being by ourselves for St. Patrick’s Day which was fine as we had been pretty busy over the course of the week and had a full weekend. This recipe was saved as it came in an email about Irish recipes to make for St. Patrick’s Day. It is a Cook’s Country recipe so I don’t have a link. I’ll type it out below. Overall, this was pretty good. The only downside was that in the end, it looks, and tastes, a lot like bratwurst over German Potato Salad. Which seems less Irish and more, well, German. But, like I said, it was good. I didn’t make any changes and even made sure I had golden potatoes. I did use a package (5 pieces) of Johnsonville Beer ‘n Brats for the sausage. It was what was in the freezer. Which is also a reason I saved this to make. I had most everything on hand. So, take it for what you will. It seemed a tad bit less Irish to me when it was all said and done but it was still a good meal. Heat oven to 325 degrees. Spray non-stick spray into a 13×9 baking dish and shingle the potatoes in the bottom. Sprinkle with 1/2 teaspoon salt and 1/4 teaspoon pepper. Set aside. Cook bacon in a skillet over medium heat until crispy (12-14 minutes or your level of crispy). Using a slotted spoon, transfer bacon to a paper lined plate. Carefully add sausages to the now empty skillet and cook until lightly browned on tops and bottoms, about 5 minutes. Transfer to a paper lined plate. Pour off all but 2 tablespoons of fat from pan and return to medium heat. Add onions, thyme, 1/2 teaspoon salt, and 1/2 teaspoon pepper. Cover and cook until onions are softened, 7-9 minutes, stirring occasionally. Add broth and vinegar, scraping up any browned bit, and bring to a simmer. Carefully pour onion mixture over potatoes, spreading onions in an even layer. Place sausages, browned side up, on top of the onions. Transfer to oven and bake until a knife inserted into the potatoes meets little resistance, about 1 1/4 hours. Remove from oven and let cool,for 10 minutes. Sprinkle with reserved parsley and bacon. 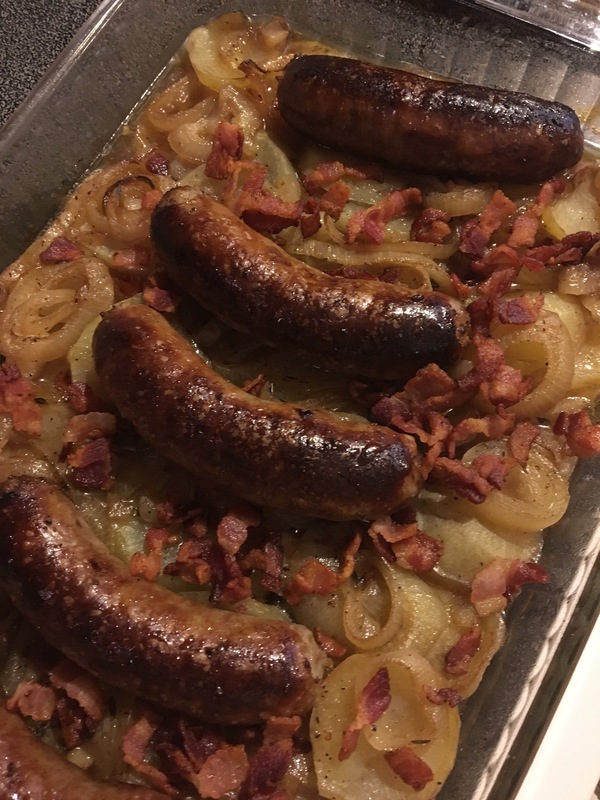 This entry was posted in Pork, Potato and tagged coddle, dinner, dublin, german potato salad, potato, sausage, st patricks day. Bookmark the permalink. We tried Dublin Coddle for the first time on St Patty’s day, it was a yummy alternative to corned beef and cabbage!